These options are for the “Fool” game only. 1. "Easy" - a professional playing to relax and ease his mind. 2. "Average" - a professional plays to gain as much points as possible. 3. "Advanced" - a professional thinks all the game situations a considerable thought. 4. "Super" - a very highly trained professional comes into game. 2 levels of “cheating” for a “roller"
1. "Easy" - cheating while the cards are beaten off, tossed up or transferred. 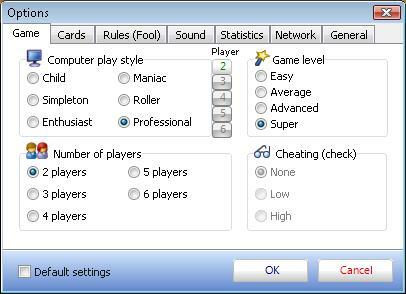 The “roller” cheats not more than 5 times but he can cheat with one and the same card several times. 2. "Advanced" - almost professional “cheating” while the cards are beaten off, tossed up or transferred. The “roller” cheats not more than 3 times in case he’s got no other options. 1. Go to "Game" -> "Parameters". 2. Then go to "Game". 3. Choose one of the 4 levels. You can do that only in case you’re playing the professional style. In case of any other game style, the level option is switched off. In case you play against several other players, you can set different levels for each of your opponents.